Playdead Studios has always been a developer of few words. Until now, a collective whose reputation rested entirely on their first creation. Back in 2010, Limbo scuttled onto the Xbox Live Arcade without much to say for itself at all. A gloomy hellscape, a determined boy and something about a lost sister was the gist of the game's description. But from its opening breath, Limbo made adamantly clear that exposition wasn't what Playdead were about. Its subjective storyline, fair puzzles and macabre visuals were striking, and all fed into a melancholy tone that my moody teenage self snapped right up. It was - almost by all accounts - quite good. And thus I found myself fatefully drawn to Inside. Six years in the making, Playdead's eerie follow-up has a lot to deliver on, and despite summoning the creeping realization that my adolescent woes may not have totally left me after all, Playdead offer an engrossing journey that plucks deeper at the cerebrum than ever before. On the face of it, Inside isn't terribly different from its spooky predecessor. You're plunged straight into the role of a young boy, left to scrabble from left to right across a series of bizarre situations. As with Limbo, Inside is void of both dialogue and text, leaving all narrative conclusions to be surmised from its twisted environments and foreboding tonal shifts. It's refreshingly subjective stuff, lending to a near-constant sense of unease that only grows more profound as you explore. But what is made clear is that Inside harbors its very own special world of gloom. It overlooks a strange, hapless dystopia; a world of many greys, with all colour a washed-out echo of the happier life that could have existed long ago. The abhorrent murkiness of Inside's flattened society is palpable, and though light is typically scarce, it lends an essential innocence to each of the protagonist's actions; a murmur of hope where notions of goodwill have since fallen obsolete. The newfangled colour scheme isn't all that's new, for Inside gently taps away at the pure-2D styles flaunted by Limbo. Interactive items might be placed just a smidge behind you, with the world's lamenting backdrops contributing as much to the game's puzzles as the immediate vicinity. The heightened amplitude takes a little getting used to, but it's generally well-handled, as the prologue offers ample chance to adjust to the game's meatier visuals. It's second-nature by the time the puzzles begin. And a good thing too. This tortured realm makes no delay assuring you that the world wants you dead. Inside flirts with death in ways as hair-raising as its sibling, involving split-second platforming, ballsy stealth maneuvers and keen observation to pass through stages unscathed. Controls are also twitchier, with character animation enjoying several marked improvements. Details such as ducking when enemies are close, or brushing nearby trees as you stop to catch your breath all add to Inside's imposing atmosphere, whilst the weight of each interactive item makes encounters tangibly vulnerable. Your character will really heave boxes, or take a couple of moments when rope-swinging to gain momentum enough to propel forward. Far from slowing the pace, it's these minor tweaks that really drive the player's connection with Inside's protagonist; something that renders the invariable threats of its world all the more affecting. But as with all Playdead's work, there's no denying that Inside is still very much a puzzle game at heart. Each level carries with it a patent sense of logic, with solutions often hidden in plain sight. Though new ideas and mechanics are added with each new chapter, no puzzle feels truly obtuse, and I can't recall one single moment where I felt out of my depth. Everything you need to scale a building or evade an enemy is always right at your fingertips, whilst any hidden essentials are alluded to by the sharp, uncluttered level design. There's a bit of trial-and-error involved, with some solutions only becoming apparent once you've bitten the dust, but Inside's abundance of save-points renders death rarely frustrating. Early puzzles are relatively straightforward, comprised of simple push-block affairs and the odd match-up trial. But what could've quickly descended into mundanity rapidly complexifies, with each new chapter proffering a new set of discoveries that darken elegantly alongside the game's ominous tone. And they darken terrifically. It's always problematic with a game such as Inside, as it's so crucially tied to its big-reveals that mentioning them here would feel nothing less than a disservice. Suffice it to say that Inside explores deeper, darker and more relevant themes than anything Limbo had to offer, on both mechanical and narrative plains. And whether you see them coming or not, they're a spectacle you won't quickly forget. Indeed I found myself saddened when the adventure drew to a close, as each twist and turn remains so uniquely memorable that returning for a second helping just doesn't feel the same. It's three-hour titch of a thing as it is, but once you know your way around the game's puzzles, it's easily over in half that. And though there are sights to see in Inside that are truly goggle-worthy, the wow-factor isn't as potent once you know they're coming. This said, returning to Inside is still something I'd recommend. As with the egg-squashing travails of Limbo, Inside proffers its own hoard of hidden collectibles to extend its foggy storyline. While there's only fourteen achievements to behold, hunting out the game's secrets can lend some welcome depth to the puzzling, adding a deeper layer of complexity that feels satisfying to crack. 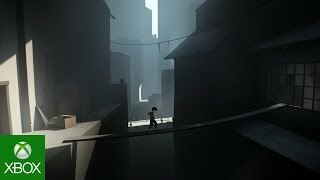 My only real gripe with Inside is that Playdead's pursuit of an evocative atmosphere often shrouds the plot. Doubtless, each chapter is a treat to behold, but ultimately they lack unity when it comes to overall storytelling. As I was launched from one calamity to the next, I began to wonder whether any of my previous discoveries would receive a satisfying payoff, and after a time anxiously chipping away at the surface, the game's jarring conclusion feels a touch out of sorts once the credits roll. And it's a crying shame, because Playdead demonstrate such remarkable cohesion elsewhere. Inside is a game of senses; one that rides as heavily on what you hear as it does on its freaky tableaus. The score is an ominous soundscape of ghostly breezes, piercing birdsong and static monotones, all of which lend to the sense of mounting pressure palpable from the very beginning. Naturally, it's only really done justice when wearing headphones. I can gab all day about riveting narratives, dystopian settings and evocative colour schemes; if you want the full experience, you'll want play it plugged-in. Inside is a twisted nightmare of a game. Mostly for the right reasons. Using the 2D layout of its first-born, Playdead's newest creation is a beast of depth, precision and uncompromising atmosphere. While the game's tonal pursuits can leave its plot feeling conflicted, none of Inside's environments feel truly wasted, breathing a quintessential fear that strikes close to the heart of modern themes. In a tarnished, grotesque, hellish sort of a way, it's rather beautiful. The washed out palette lends an intriguing sense of depth, with just enough colour to drum home the dystopian setting, against an undulating soundtrack that makes this a headphone-essential experience. The logically-structured puzzles evolve over time, consistently bringing new ideas that feed into the game's ominous tone. No conundrum is a mindbender, however, which some challenge-seekers may find unsatisfying. A three-hour trek of weird environments, logical puzzles and unforgettable setpieces. Each chapter remains distinctly memorable, but they can feel conflicted amidst the overall narrative. Inside remains uninterrupted from start to finish, boasting a smooth framerate and a thankful deficit in glitchery. Inside is dark, deep and deliciously bleak. Its ominous world speaks continually - even if it's never entirely clear what is being said. Its puzzles aren't mindbending, but they're duly affecting - extending the mechanical and thematic nuance nudged at by Limbo. Inside is ranked #70 out of 1436 total reviewed games. It is ranked #3 out of 138 games reviewed in 2016.